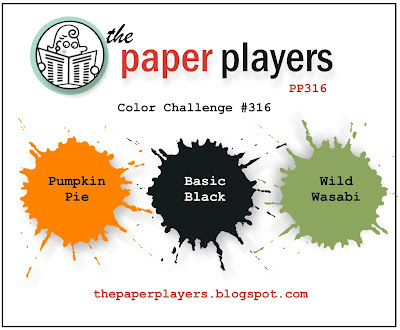 Today I'm playing along with the Case This Sketch & Paper Players challenges. It was an interesting combo, it was hard to come up with something other than Halloween with the colour combo from the Paper Players, but thankfully the sketch from Case This Sketch gave me some ideas & I have been wanting to play with my new Flourishing Phrases bundle!! So here's what I've made & I hope you like it! I have started with a Thick Whisper White cardbase. When I was putting it all together at the end, I really felt like it needed a little something extra, so I've added another layer of Whisper White up on Dimensionals & I'm really happy with the little added interest it's given. I have used Watercolour cardstock for the center strip, Aqua Painted with Pumpkin Pie & flicked with the Gold Wink of Stella pen. 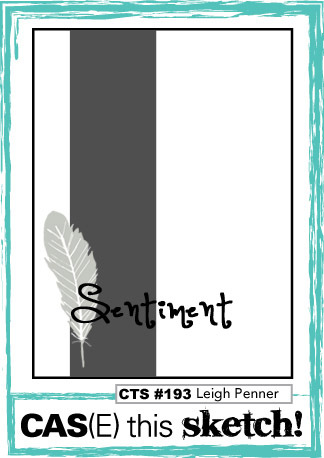 All of the die cuts, sentiments & images come from the Flourishing Phrases bundle, except for the banner stamp & die cut which is from the Number of Years bundle. I have used the Pumpkin Pie & Wild Wasabi Stampin Write Markers to colour in the floral stamp & I have also propped this up on Dimensionals, with a little Gold Metallic Thread wound behind it. I have fussy cut the floral image & I have used the Precision Plate on my Big Shot for the die cuts. I have stamped off the Pumpkin Pie ink before stamping inside the card with the floral image & I have added the Thank You sentiment in Black Momento ink. Both the image & sentiment are from the Flourishing Phrases stamp set.